We are celebrating International Fibromyalgia, ME/CFS & Lyme Awareness Day with a competition that is easy to enter. .Here at Fibro Blogger Directory we think that all people with chronic illness are super heroes with super powers. We think we use our powers each and everyday. Hey! even getting out of bed can be a super power somedays. 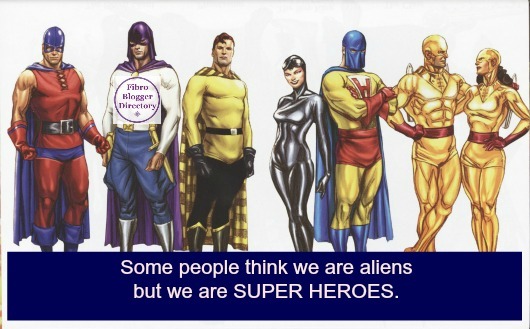 So why not tell us your super power? We know you might have more than one so please feel free to let us know here in the comments. to spend as they wish. The winner will be announced early in June. I wouldn't say super power, but I am good at seeing the better, more positive side of not-so-great issues, situations, etc. I've developed my ability to foresee situations that may make me overwhelmed or heighten my anxiety, and make adjustments to avoid the negative side effects. It doesn't always work, but 75% of the time it does. My super power is being able to keep a smile on my face, and enthusiasm in my voice, even when I'm crying from pain on the inside. My superpower is making sure I have a rest every afternoon, no matter where I am. It helps me get through the rest of the day. My pain always seems much worse if I miss my rest. My super power is my stubborn Irish demeanor. I refuse to accept defeat from something I can't see or touch. I also get a massage every other week. my super hero power is making my family happy. I may not beable to do as much with them physically, but we have movie nights and what not. they keep me going too! My super power is my ability to share Reiki healing energy, kindness, and love to my friends no matter how much pain or sadness I'm suffering from. I also practice meditation and keeping a positive outlook that I also share. My superpower is being a lot more forgiving and seeing that things might not always be as they seem.